What’s in your Easter basket? I’ll tell you what’s in mine: treats from Maisie Jane’s! Almond candies are naturally egg-shaped. That makes them traditional for Easter in places like Portugal where amêndoas de Páscoa (Portuguese Easter almonds) are exchanged by practically everyone! Amêndoas are pretty much the same as the many chocolate almond treats we make at Maisie Jane’s. And they come in so many different flavors you are sure to find something every family member will enjoy. 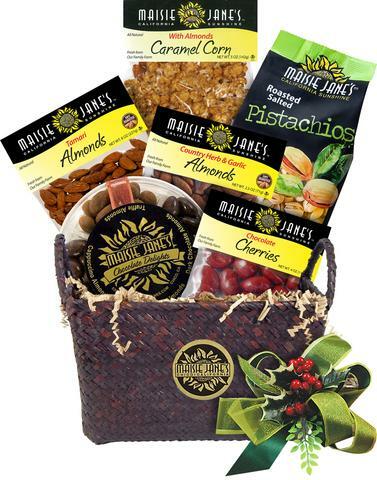 Pick out a variety of family favorites to put everyone’s Easter basket or . 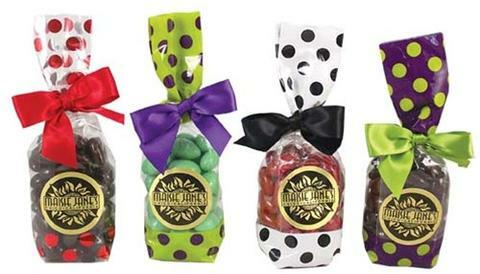 . .
One of my Easter basket must-haves are these polka dot treat bags. They’re so colorful and cute and tied with a bow. There are six delicious varieties to choose from: Dark Chocolate, Mint Chocolate, Chocolate Toffee, Cappuccino, Chocolate Truffle, and Milk Chocolate. Are you gathering with family for a big Easter dinner? Make sure to get one of our Chocolate Delights Gift Rounds! Four varieties of our most popular offerings in an easy-to-serve round tray. 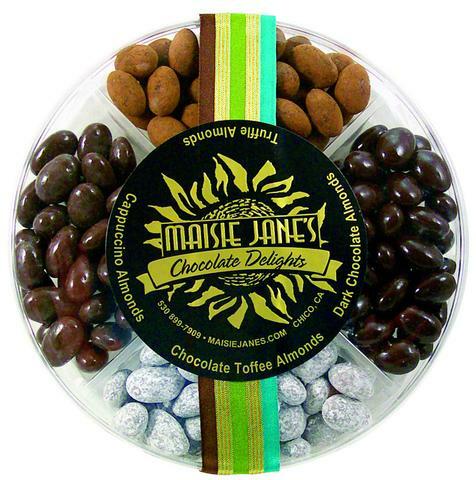 It includes Dark Chocolate, Truffle, Chocolate Toffee and Cappuccino Almonds topped with a beautiful ribbon. Even more fun is our Family Fun or Office Enjoyment Basket #2, decorated for Easter with a season-appropriate bow. 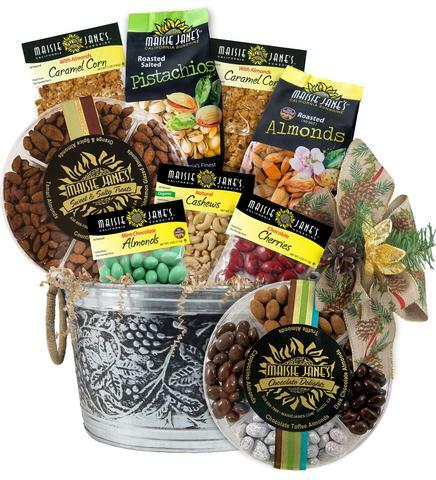 In it you’ll find a small Chocolate Delight Round, a bulk bag of Roasted Salted Pistachios, Chocolate Cherries, Caramel Corn with Almonds, Country Herb & Garlic Almonds, and Tamari Almonds. Come on by our gift shop at 1324 Dayton, Chico, CA 95928 and pick up your favorites with a wide selection of other Easter gifts today!